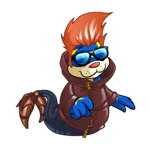 You know you're a veteran Neopets player when... 1. Your first Neopet is old enough to at least be in primary school now, if not secondary school... or college. 2. Speaking of which, you remember feeling absolutely certain that TnT was going to launch NeoSchool soon, and stocking up on school supplies for your pets just in case. 3. At least one of your favorite games now resides in the Games Graveyard. 4. You alternate between deeply regretting converting your pets... then visiting the NC Mall and being glad you did. 5. You have strong feelings about the Darigan vs. Meridell rivalry. You can't just like both of them, pick a side!! 6. Now that you think of it, you have strong feelings about every plot you've participated in. 7. You remember the feeling of awe you had when the back half of the Neopian globe was first revealed. 730 Days of Throwing Away Neopoints or, How I lost 19 million Neopoints over the last two years. A little over a year ago, I published an article in the Neopian Times detailing my results with spinning the Wheel of Extravagance for 365 days. In that article, I wrote in the very first paragraph that I was going to spin until I either landed on the coveted Scorchstone wedge, which would award you one rarity-100 item, or lost 20 million Neopoints. Well, two years in, and I'm close to that 20 million upper limit (and still haven't landed on that elusive Scorchstone wedge). With statistics data like this, more data points usually presents a clearer and more accurate picture, so I figured this was as appropriate a time as any to update you, my avid audience. My name is Letty, and I fed 75 Kadoaties in a week. No, I didn't stay awake long into the dead of night, nor did I spend millions of Neopoints satisfying those greedy Kads asking for Grey Toasts up in the top row. I just wanted the avatar, and am a notoriously impatient person. Impatience is always the most risky ingredient in any goal I brew up—usually, it's something we all tell our kids and our Neopets tell their Petpets not to have. I awake to a sound that didn't belong. It was in-between an old lady cackle and the cackling of the fireplace... which was NOT currently lit. I am about to go back to sleep until I see something or someone shift under the shadows of my curtains. Now I am WIDE awake. I throw my covers to the side. "Who's there?" I ask unintelligibly. It’s okay... I reassure myself. I’m still fighting to stay awake. I am sure that I’m not mistaken as I see a crescent moon like grin and a pair of golden eyes akin to two Neopoints. I blink, and the thing by the window is gone in a flash. Instinctively, I go to a picture frame that I find has been moved. I’m quite the perfectionist and find it uncharacteristic of the portrait to be askew. I quickly remove the frame from the wall and let out a strangled gasp. My secret vault has been opened and my very rare Enchanted Amulet has gone missing! A terrible knot, like the knotted cloth necklace I had recently gifted a friend, tightens up my insides. My throat has gone as dry as the Lost Desert. I run to my window and look down at the clear front yard. There HAD been somebody at the window. I hadn’t been dreaming... and whoever it was stole my Enchanted Amulet. For some reason, my mind is working faster than usual and I run to the nightstand next to my bed, shaking the Baabaa lamp and bottle of water right off the surface.I do not take notice of the broken contents now at my feet as I find what I was looking for. I hold up a business card. In a simple black, bold type font, it reads: Tenicie Sheridan Holman Private Detective. For the Creep family, the moving process was an awful one. No one was expecting it, heck, no one wanted it, but Hannah thought it would be a good idea to bring the family together in one big Neohome to bond better. It was a winter morning when she brought the news. "Guys, I’m back!" Hannah shouted as she slammed through the door. "Thank Fyora," Ann the cloud Poogle sighed with relief, "we were waiting for you to be done with business. So how much money did we make?" Hannah chuckled nervously as she put her belongings down and getting a hug from her pet, Konjik the baby Kiko. "Actually none." Spike the blue Shoyru spit out his orange juice and turned to look at his owner. "You said you were going on a business trip in order to get us painted!" Spike was disappointed beyond belief but not as disappointed as Ursula the ghost Usul was to hear that she wasn’t going to be painted as a Usukigirl. "You said I was going to be a star! I was going to be Neopia’s next top idol!" Ursula flew over to Hannah after dropping her cereal and stared in disappointment. Hannah gave Ursula a stern look, bent over, and said, "I never said that. You said that. Actually, I have better news than that can ever be!" Kon looked up at Hannah and asked, "Better than all of us getting painted?" Hannah picked up Kon and said, "Better than that. The good news is all of your cousins are going to be moving in with you guys!" No one was laughing, no one was smiling, only staring at Hannah in disbelief. "ALL of them?" Spike asked as he backed away slowly.